The Lyon Beefsteak Club is a French non-profit organization I founded with Anne and Sarah, co-editors on my website, Vampirisme.com. The name came from a famous 19th century male dining club which Bram Stoker belonged to. The funny thing is, when we started our organization, there were more women than men in our Beefsteak Club—and most members were vegetarian. The name was inspired by intellectual gatherings in the previous centuries, salons. In this case, we wanted something fun, but interesting too—to teach people things. The main idea was to create a recurring event that would show people the many faces of the vampire myth, in literature, cinema, video games, etc. 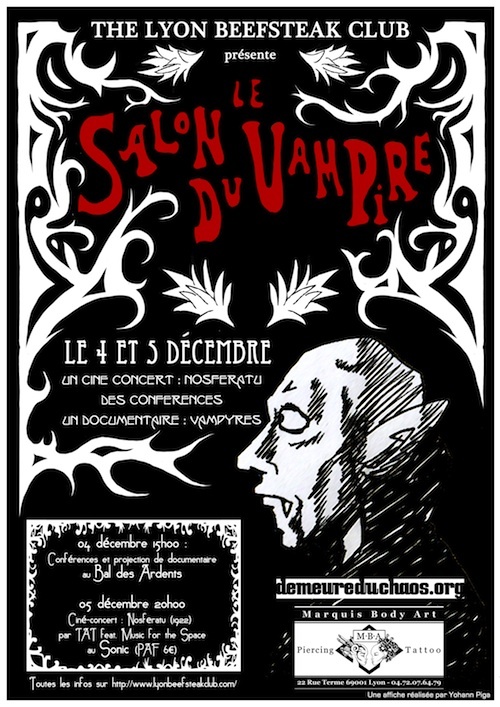 The first “Salon du vampire” took place on December 4–5, 2010, and was fairly low-key. But it showed us the big interest many people had in the subject. It was held in a small bookshop called Le bal des ardents, which quickly filled with visitors. The program of the first afternoon was a bit chaotic. We skipped from paranormal romance (“bit-lit” [bite lit], as we called it here), Dracula, then wrapped up with the vampyre subculture. Our guests were André-François Ruaud and Isabelle Ballester (for their book Les nombreuses vies de Dracula, a imaginary biography of Bram Stoker’s character), Father Sebastian and Laurent Courau (for the documentary Laurent made on the vampyre subculture). We never expected Father Sebastian to come, so it was a good surprise to see him appearing in the beginning of the afternoon, asking for a place where he could make fangs. In fact, he was still making fangs when we started the projection of the documentary he appeared on. A bit surreal to see him keep his head up to watch himself speaking on screen! The program of the second day was based on a association with two groups, TAT and Music for the Space. They specially composed a musical score to be played live while Nosferatu (Murnau’s movie) was playing. A good way to conclude this first “Salon du vampire”, during a Sunday night, on a barge moored along the quays of the Rhône. For most of the following year, the Lyon Beefsteak Club was put on hold. We re-activated the organization to start a cycle of vampire movie events, which lasted nearly a year. During the evenings of this cycle, many themes were addressed, such as Countess Bathory, Dracula’s family, and vampires from outer space. Each night was introduced by Narcisse de la Tour d’Ivoire (who became our mascot), a character played by actor, Benoit Bornier. But the event was very low-key with little turn-out. So, we decided to revive the salon. 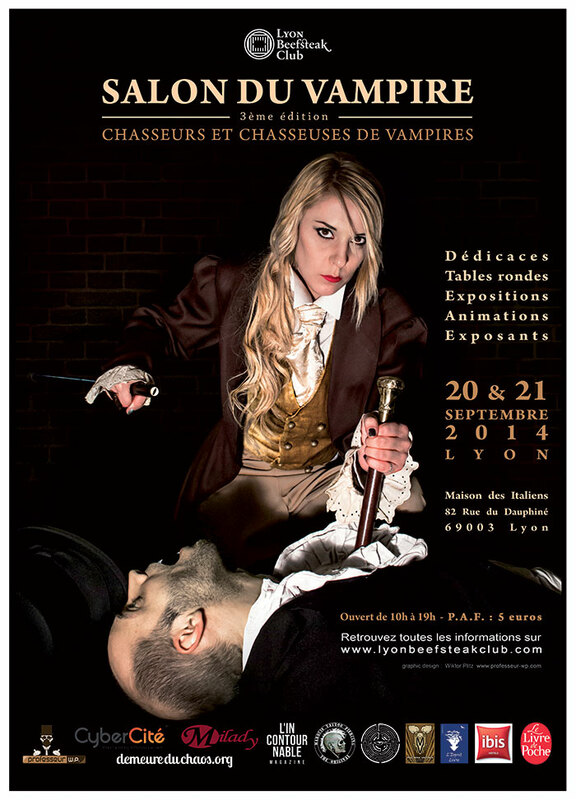 The second “Salon du vampire” took place on November 3–4, 2012. 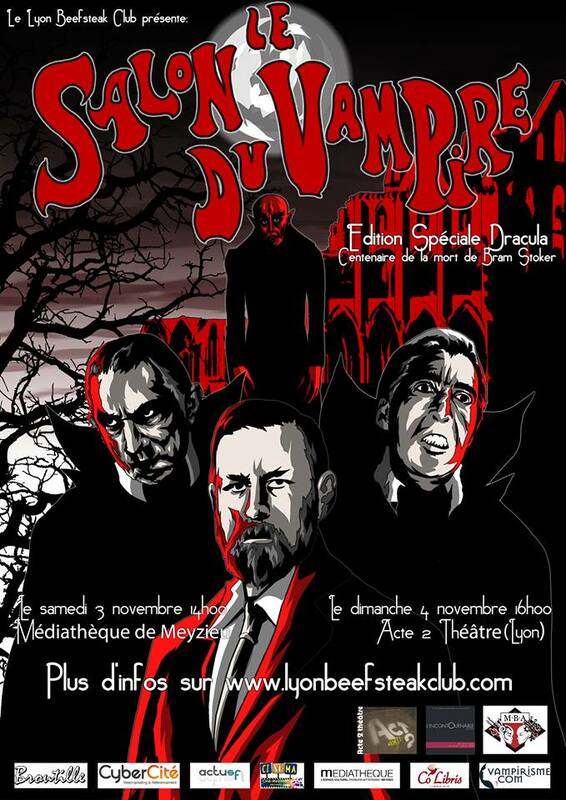 It was the centenary of Bram Stoker’s death, so we decided on a Dracula theme for the second “Salon du Vampire.” A media library on the outskirts of Lyon agreed to host our event. This time, we had enough financial resources (thanks to the partnership we built) to invite more authors than the first edition. Jean Marigny (an eminent vampire scholar), Alain Pozzuoli (highly-regarded for his writings about Bram Stoker), Simon Sanahujas and Gwenn Dubourthoumieu (an author and photographer who wrote A la poursuite de Dracula, “on the trail of Dracula, from Romania to England”) were present to talk about the fictional count and his historic counterpart. The content of this salon was more homogeneous than the first one. Marigny tracked the history of Dracula in literature since Dracula was published in 1897, Pozzuoli summed up the life of Stoker, and Sanahujas and Dubourthoumieu recounted their trip using photos extracted from their book. We concluded the afternoon with a panel including all guest speakers about the difficulties adaptating Bram Stoker’s novel to the screen. The evening was devoted to Francis Ford Coppola’s Bram Stoker’s Dracula (1992), and the following day to Nicolas Guépin’s theatrical adaptation of the novel. In 2013, there were many changes on the organization operations. One of the founding member quit, three new members came (including a graphic designer). We started some new events, such as conferences dealing with subjects peripheral to the vampire; the first was on embalming. Our graphic designer followed an embalmer during one week, the photos resulting of this week, associated with a presentation of the embalmer being the whole point of the evening, followed by Q&A with some professionals. The third edition of “Salon du vampire” took more time to initiate. We had issues (including a big one with difficulty finding a place to hold the event). Thanks to our partners (this time including a bookshop), we finally succeeded in finding what we were looking for: a 400 square metres hall. This salon will be devoted to vampire hunter and huntresses, from Van Helsing to Buffy. It will take place on September 20–21, in a place called La maison des italiens. It will be the first time we have the same place during the whole event (not only for the conferences part). There will be many exhibition stands (bookshop, game shop, editors, jewelry designers, etc.) at the event, as well as some animations (including self-defense demonstration, in a Buffy way). For the conferences / panel part, we have enough in the budget to invite nine vampire authors and experts. An exposition of many old books about vampires and some rare artefact (owned by Nicolas Delestre, out secretary) will be available on site. Jean Marigny, Jacques Finné (anthologist, translator), Sophie Dabat (essayist, novelist) and Nicolas Stanzick (essayist) will discuss the subject from an academic perspective. Morgane Caussarieu (novelist and short story writer), Fabien Clavel (novelist and short story writer), Jeanne-A Débats (novelist and short story writer), Li-Cam (novelist and short story writer) and Pascal Croci (illustrator) will discuss fictional aspects. Six panels are planned for the weekend. See our website for details. We hope to see you there! Formatting Changes, Showcases and Photo Captions—Oh My!